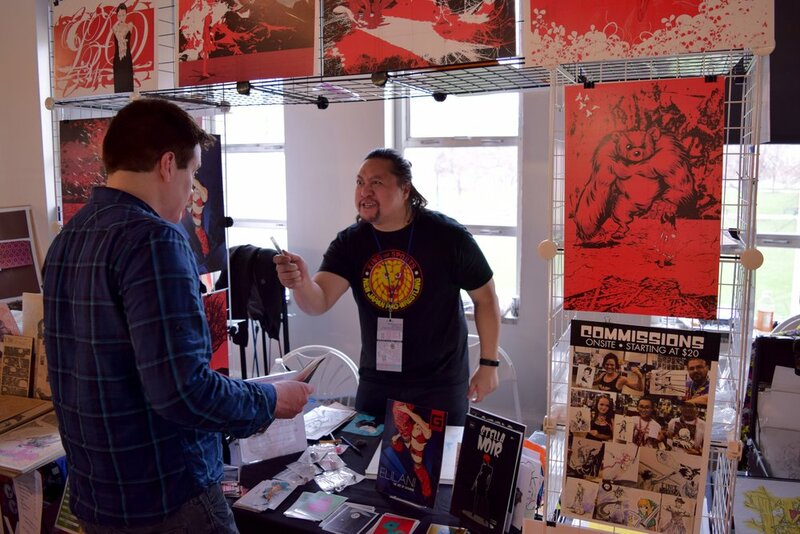 A Walk Around the Denver Independent Comic & Art Expo (DINK!) 2018 - With Over 100 Photos! 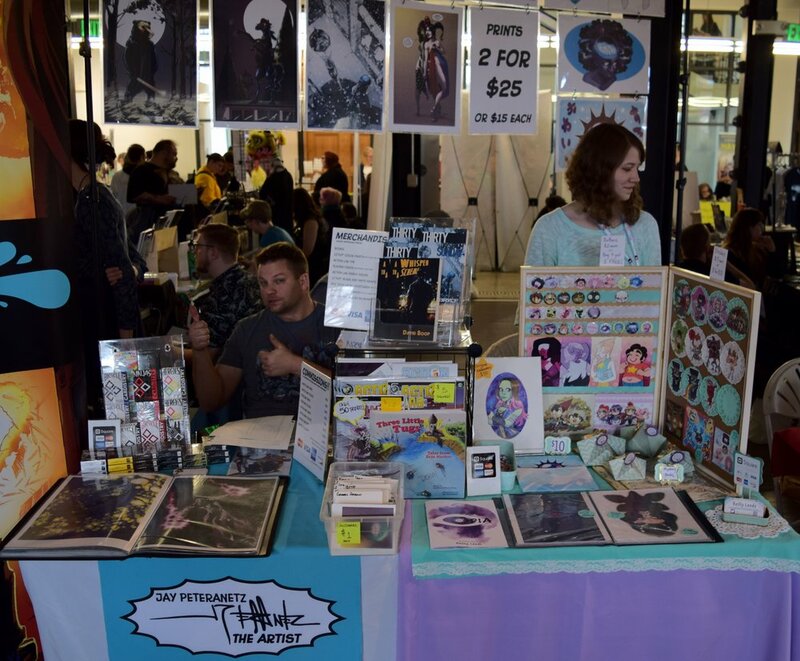 The weekend of April 14 & 15 marked the celebration of the third annual Denver Independent Comic & Art Expo (or DINK! for short) - and I was once again reminded why this is my favorite convention to attend every year. The meeting of minds between so many different facets of comic creation is an awesome and inspiring sight. There were long-time creators that have dedicated their careers to independent characters. There were members of the early underground comix movement. There were creators who work steadily for the Big Two comic companies, but whose roots in (and love for) independent comics are obvious. And mixed in among them were creators and artists from every walk of life, with diversity and representation clearly being on the forefront of the show-runners' minds. Joe Kelly at the Alamo Drafthouse. The show started for me on the evening of Friday the 13th - always a good night for a movie. DINK had brought out Joe Kelly as a guest of the show, and the Alamo Drafthouse was hosting a viewing of his new movie I Kill Giants with an audience Q&A afterwards. I grabbed my complimentary bunny ears and movie poster and headed in to the theater to find my seat. The film was touching and weird, with an emotional ending. When Joe took the stage, he seemed genuinely pleased to be there - and the audience was enthusiastic to speak with him. I will have a full review of that evening up soon. The actual convention started on Saturday morning with everyone setting up at the McNichols Civic Center, located right in the middle of downtown Denver. The expansion that the show has undergone in the past year was evident from the first steps in the door. The aisles were a bit tighter than last year, and the whole place looked a little more crowded - but the show has grown to include over 250 exhibitors spread across the three floors of the building. That number is up almost 100 tables from last year. Here is a gallery showcasing just a sample of the many creators who were on display and representing independent comics! Erin Nations hides while David Espy & Alex Delia pose at DINK 2018. Eyesis #5 from Alex Delia & David Espy. Gumballs #1, #2, #3, &#4 from Erin Nations. Ron Ruelle was on hand with his newest book: Be Kind, Rewind - A Graphic Novel About A VHS Tape of a Movie About Dachshunds. Be Kind, Rewind from Ron Ruelle - front cover. 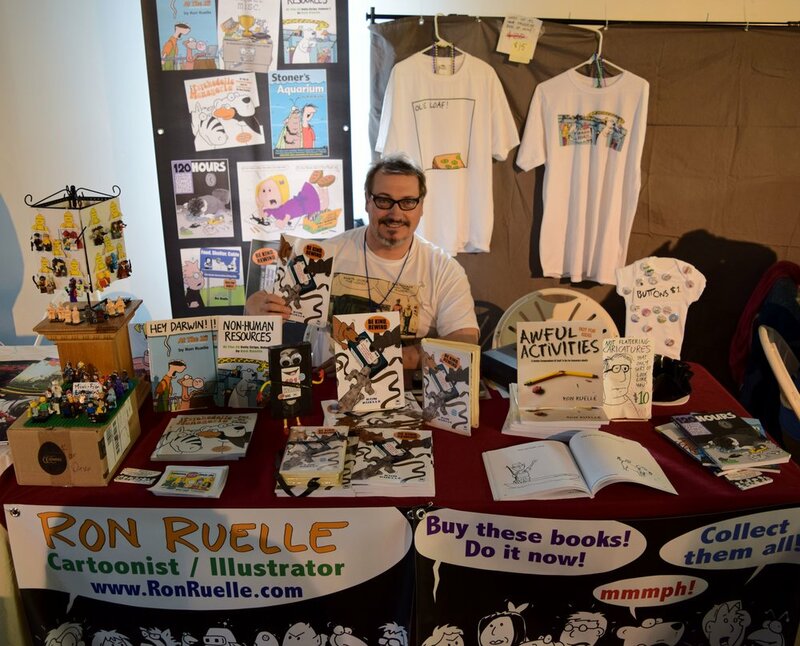 Ron Ruelle at DINK 2018. Be Kind, Rewind from Ron Ruelle - back cover. 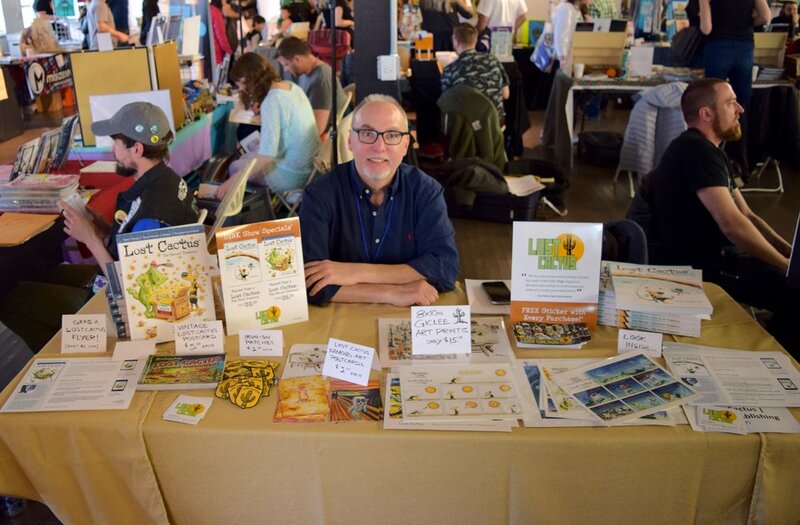 Bob Conway, a Denver local comic book printer known for his quality printing and quick turnaround, was selling mini-comics and indie books that his company has printed through the years. Bob Conway at DINK 2018. Independent and Mini comics from Bob Conway. 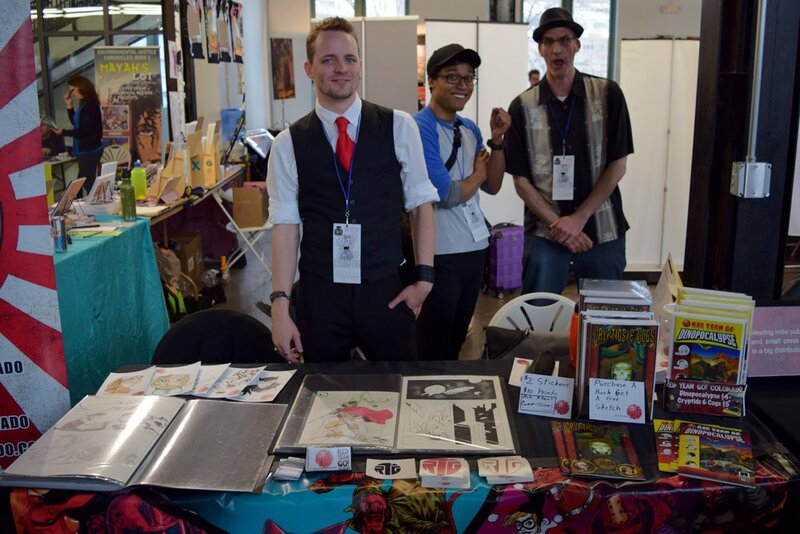 Artist Gerhard Kaaihue had a table displaying his comics and art, as well as a new project combining the talents of several Denver local artists and the dancers of the Clocktower Cabaret Burlesque. Gerhard Kaaihue at DINK 2018. 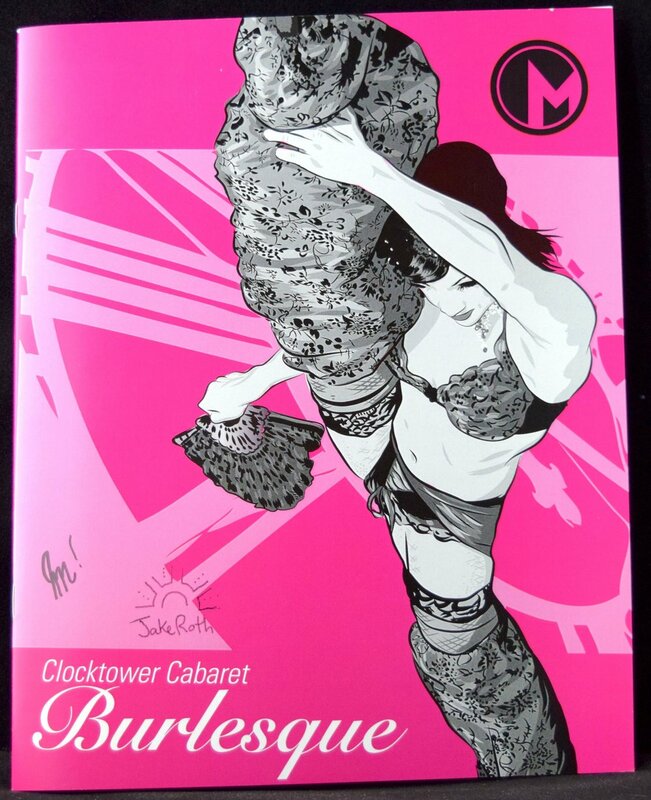 The Clocktower Cabaret Burlesque project, with a cover by Gerhard Kaaihue. Gerard and author Todd Jones engage in... we'll call it lively debate. 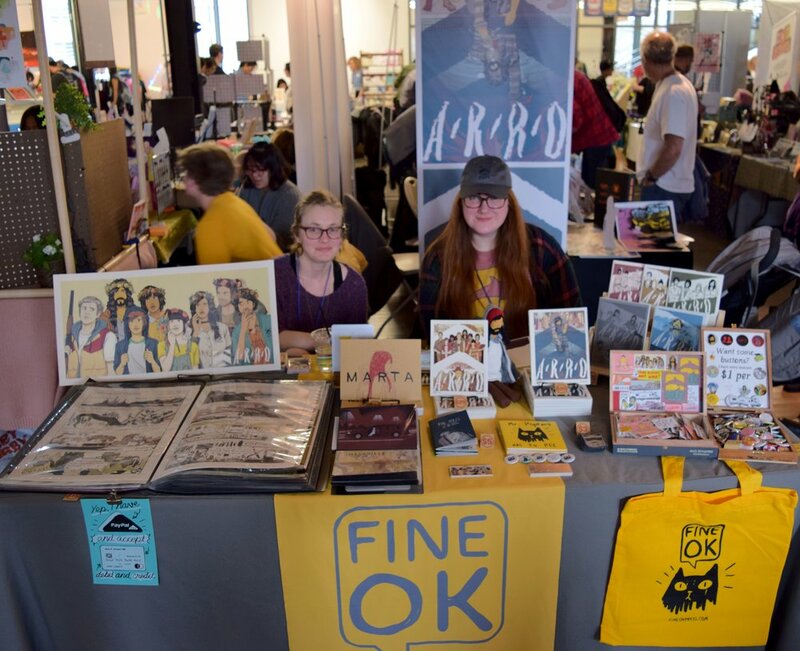 I stopped to talk with the folks at the FIne Ok Press table, who were there with their book Arro. Jay Peteranetz is a staple of the convention scene here in Denver, and he introduced me to his tablemate - Ms. Reilly Leeds. Both of them have books out now from Action Lab. Kenton Visser was looking tired set up next to Mark Stack (who may very well be hiding under the table). The ladies of Fine Ok Press at DINK 2018. Jay Peteranetz & Reilly Leeds share a table at DINK 2018. Kenton Visser shares a table with Mark Stack (who is not in the photo). Josh Trujillo was set up selling his new hardcover Love Machines and issues of the Dodge City series, but I walked away with a copy of his graphic novel looking at Adventure Gaming - Death Saves. Josh Trujillo at DINK 2018. John Hopkins and Red Team Go Colorado were on hand selling their books, while Jerianne Fulton had her enchanting dark arts on full display. John Hopkins at DINK 2018. Colton Muheim, Wynn Green, & Terry Schayes of Red Team Go! CO.
Jerianne Fulton at DINK 2018. CreepHouse Comics was set up with Kevin Gentilcore manning the table. This was the first show in a while where Kevin had left prints out entirely and only sold books, and he was pleased with the results. Kevin Gentilcore of CreepHouse Comics at DINK 2018. Krush McNulty from CreepHouse Comics. Kaitlin Ziesmer, Mallory Hart (malloryhartart.com), and Aubrie Van Zandt (Van Zayton Arts) were all set up to sell for the weekend. Kaitlin Ziesmer at DINK 2018. 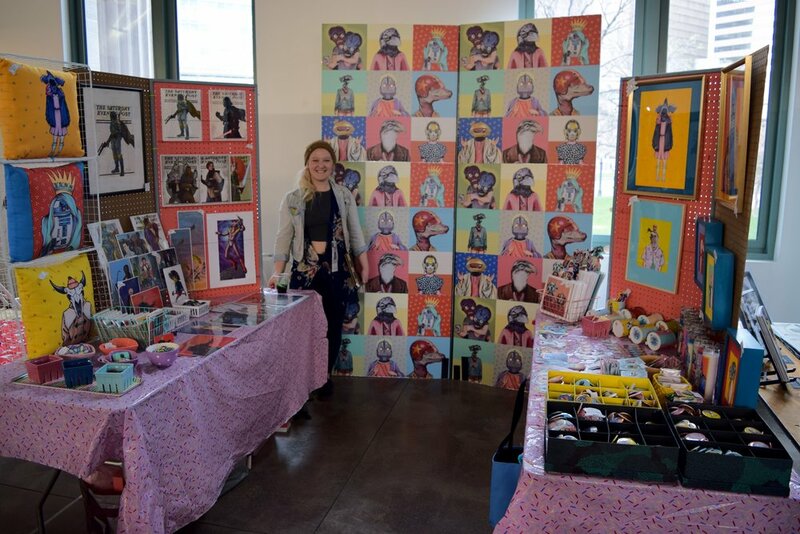 Mallory Hart Art at DINK 2018. Aubrie Van Zandt of Van Zayton Arts at DINK 2018. Oil Can Drive and Exit 6 creator Sean Tiffany had his books in both trade paperback and single issue formats. Sean Tiffany at DINK 2018. Oil Can Drive trade paperback and sketchbook, by Sean Tiffany. Daniel Crosier had an assortment of his original art (drawn on blocks of wood) for sale along with his comics. 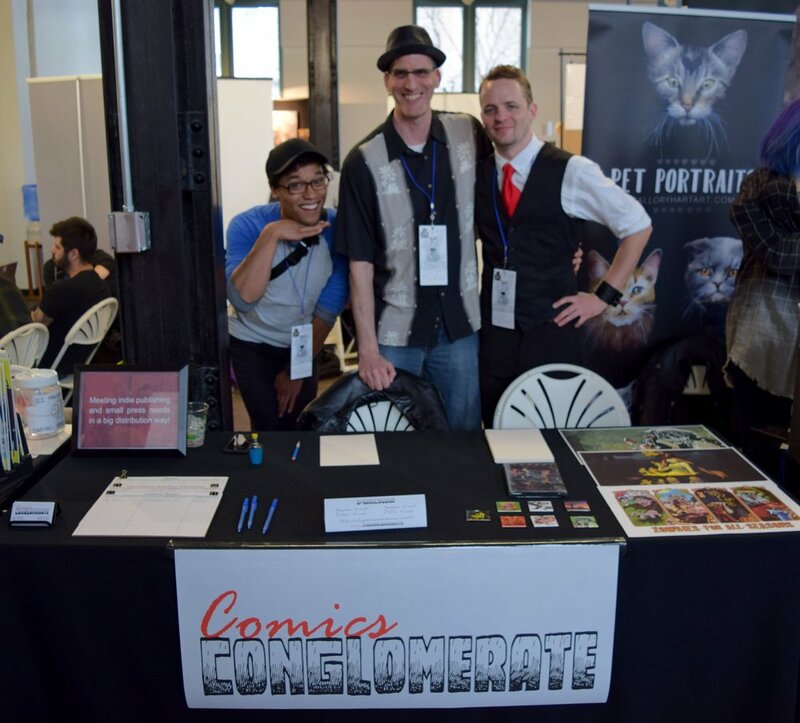 Terry Schayes and Colton Muheim were promoting their new indie comic distribution company - Comics Conglomerate. Jay Sternitzky & Mateo Cantu were both representing Paper Dreams Productions this year with art and books for sale. Daniel Crosier at DINK 2018. Wynn Green (of RTG!CO) stands with Terry Schayes and Colton Muheim at DINK 2018. Jay Sternitzky & Mateo Cantu at DINK 2018. Phil Buck & Tim Santos were behind the Those Shadow People table selling copies of the Those Shadow People comics as well as vinyl from their band Fresh Hats Tight Beats. So Many Things from Fresh Hats Tight Beats. Phil Buck & Tim Santos of Those Shadow People at DINK 2018. The Thread from Fresh Hats Tight Beats. Just because a convention specializes in independent comics does not mean that there is no place for comic vendors. A handful of Denver local comic shops - like I Want More Comics - were present to make sure back issues of our favorite indie books were available. Sean Anderson of I Want More Comics at DINK 2018. 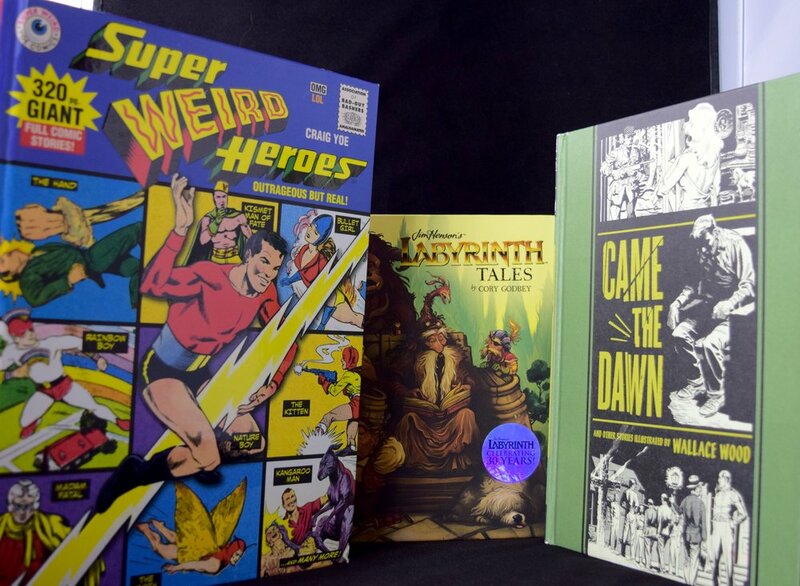 Hardcovers from I Want More Comics. Back issues at DINK 2018, including a Shannon Wheeler mini-comic. Back issues at DINK 2018, including early Jules Feiffer books. Stevie Rae Drawn and Jacquelyn B. Moore had their art out on display, while Thea Jovie Hunt was celebrating the release of her first comic book - Amelia! (it sold out by the end of the show). Jacquelyn B Moore & Thea Jovie Hunt at DINK 2018. Amelia! from Thea Jovie Hunt. Stevie Rae Drawn at DINK 2018. James O'Barr, the creator of The Crow, had a table where he was selling his prints and original art. The best deal at the booth were the stories of his time in the industry, though. And those were free. James O'Barr at DINK 2018. A commission from James O'Barr done for me at DINK 2018. Good Chemistry is a dispensary in Denver that teamed up with DINK to provide a weed tour for VIP ticket holders. They also had a booth giving away free lighters with painters creating a marijuana themed mural on a large canvas. The Good Chemistry booth at DINK 2018. Good Chemistry was giving out free lighters and S.T.A.T.S. books. The Good Chemistry painting at DINK 2018. Rafael & Kristina Maldonado-Bad Hand had a table with their partner Kevin Butcher. Rafael had a new issue of his book Pilla, Kristina was selling her Lakota playing cards, and the baby made sure that things stayed cute. Kevin Butcher with Kristina, Koda, and Rafael Maldonado-Bad Hand at DINK 2018. Pilla from Rafael Maldonado-Bad Hand. Some of the card designs for the Lakota Playing Cards, from Kristina Maldonado-Bad Hand. Ztoical had prints and art out for people to browse through, while Laurissa Hughes, Amanda McManaman, & Alex Lupp all had books on display for the attendees to see. Laurissa Hughes & Amanda McManamanat DINK 2018. Alex Lupp at DINK 2018. Laser Party had a table where they were busy selling comics, t-shirts, and pins - but I was taken in by the original art of Joe Oliver off to the side. I bought a whole bunch of it. A Witchy Lady from Joe Oliver. Joe Oliver, Elijah Taylor, Sam Grinberg at DINK 2018. A zombie head from Joe Oliver. As a long-time artist for the groundbreaking Cerebus series, Gerhard was one of the most talked about guests at the convention. Both he and his wife greeted everyone who stopped by the table with a smile, and they were generous with their time and their stories. I hope to see them out here again. Gerhard and his lovely wife at DINK 2018. A commission of Cerebus from Gerhard. Matt Kindt had some serious aviator shades to go with his booth full of comic goodies, Bryan Irwin was set up at a table demonstrating his new video game, and Jesse Dubin was out representing his company - 8th Wonder Press. Matt Kindt at DINK 2018. Bryan Irwin at DINK 2018. Andrew Middleton & Jesse Dubin at DINK 2018. Carolyn & Chaz Kemp were set up at a table and selling his art and copies of her books (which he also illustrated). Carolyn & Chaz Kemp at DINK 2018. The art of Chaz Kemp. Neil Ewing can always be counted upon to have some weird mini-comics on hand, but at this show he had also printed out the various layers of a photoshop file onto acetate - letting you really see and study how he used each layer to build the whole. I had never seen a book quite like it. Neil Ewing's trading card stand's in for an actual photo of the man. PeaceWays Returns from Neil Ewing. A physical photoshop file, from Neil Ewing. Microcosm Publishing had their full spread of books available, the Denver Public Library had a table set up to make custom buttons for kids, and Matt Verges had unique skate decks bearing his art for sale. Microcosm Publishing at DINK 2018. The Denver Public Library at DINK 2018. Matt Verges at DINK 2018. Amber Padilla had new mini-comics available for the show, the Art Order was selling copies of their graphic novels, and Jeremy Lawson & Jen Hickman were looking fabulous (did they really need to be doing anything else?). Amber Padilla at DINK 2018. The Art Order at DINK 2018. Jeremy Lawson & Jen Hickman strike a pose at DINK 2018.
Pepper & Bill DeLuca of Peppercopia Publishing were debuting the newest issue of there series - Side Stories of Camp Lake Kikipapi. Pepper & Bill DeLuca at DINK 2018. Campfire Stories of Lake Kikipapi #1 & the new issue Side Stories of Camp Lake Kikipapi from Bill & Pepper DeLuca. Pidge had a table covered in issues of her series - Infinite Wheat Paste, the Talbot-Heindl Experience had several issues of their Bitchin' Kitsch 'zine for sale, and is Press had a full spread of 'zines and artbooks available. The Talbot-Heindl Experience at DINK 2018.
is Press at DINK 2018. Creating both the badge art and the program art for DINK this year, Heather Mahler had a large display selling her art, prints, and stickers. Heather Mahler at DINK 2018. DINK 2018 program with art from Heather Mahler. DINK 2018 media badges with art from Heather Mahler. The ladies of Vagabond Comics displayed several issues from their namesake series, while Bob Parks and Cachet Whitman both had their art for sale - but Cachet was also premiering her first artbook. 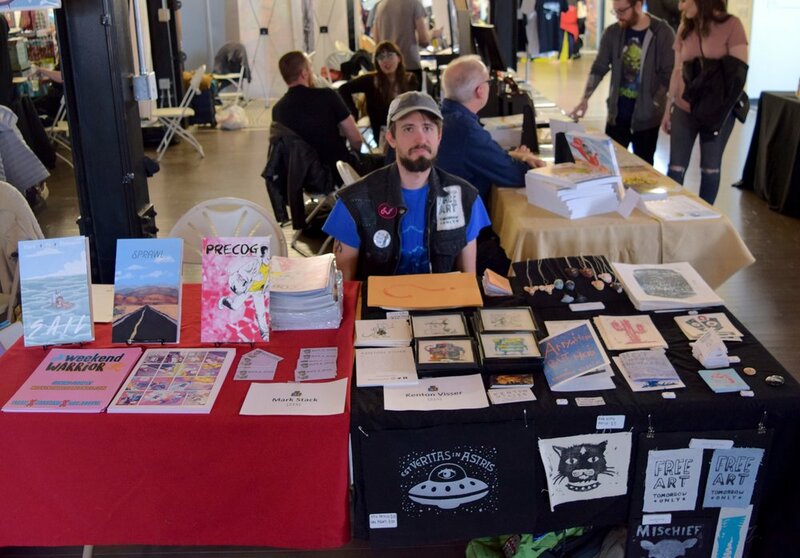 Vagabond Comics at DINK 2018. Art Summary 2017 from Cachet Whitman. Cachet Whitman & Bob Parks at DINK 2018. White Stag Productions and West of Oz creators Sean Benner & Nick Winand were able to premiere two new issues of their series as well as a new trade paperback for the DINK show. Watch Nerd Team 30 for a full interview with this team coming up soon. Sean Benner & Nick Winand at DINK 2018. West of Oz TPB by Sean Benner and Nick Winand. Howard Cruse and Denis Kitchen sat side-by-side at tables selling collections of their underground comix and offering some of the best stories in the industry. Howard Cruse at DINK 2018. "Bad Temper on the Book Tour", original art from Howard Cruse. Howard Cruse & Denis Kitchen at DINK 2018. Karl Christian Krumpholz premiered the first 6 issues of his 30 Miles of Crazy series. Having always been released in book format, this is the first time that Karl has tried the single issue format for the title. Holding the new issues in my hand, the binding feels solid and permanent, and the materials are obviously high quality. Like Mr. Krumpholz himself, they are elegant. 30 Miles of Crazy #1-3 by Karl Christian Krumpholz, premiering at DINK 2018. Kelly Bearden and Karl Christian Krumpholz at DINK 2018. 30 Miles of Crazy #4-6 by Karl Christian Krumpholz, premiering at DINK 2018. Lonnie Allen was there, with his comics and art - and of course, free copies of Suspect Press (for which he is the art director). Lonnie Allen at DINK 2018. The Spring 2018 edition of Suspect Press. Deliniate from Lonnie Allen - a 2017 Dinky Award winner. R Alan Brooks, Matt Strackbein, & Jolyon Yates proudly show off the new prints that they had made for their book - The Burning Metronome, while Jake Fairly raises a spiked glove in the name of his book - This is Heavy Metal. R Alan Brooks, Matt Strackbein, & Jolyon Yates at DINK 2018. Jake Fairly at DINK 2018. Joe Kelly and his self-described partner in crime, Steven T. Seagle were both happy to tell their stories of working in comics and their translations to film - and both still seemed genuinely happy to meet so many fans. Joe Kelly & Steven T. Seagle at DINK 2018. An I Kill Giants movie poster, signed by Joe Kelly. ... and that covers less than half of the exhibitors that were tabling at the show! DINK is growing by leaps and bounds every year, and it just keeps getting better every time that they have one. 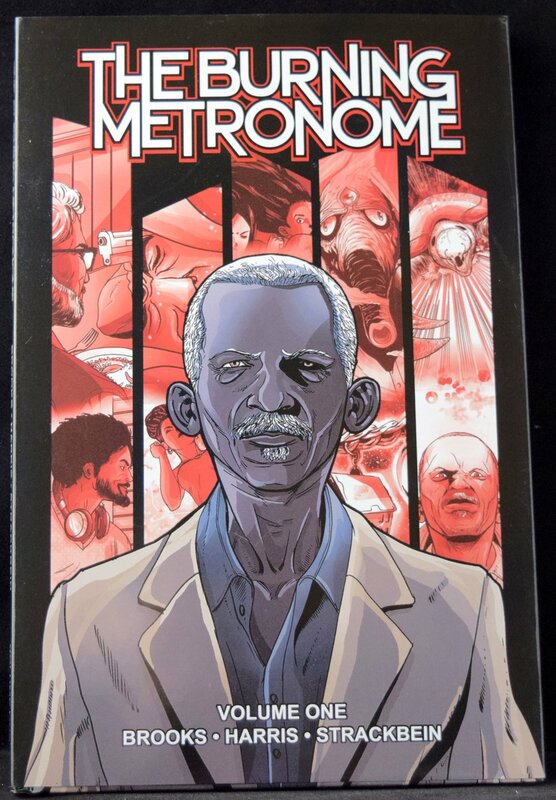 With a real focus on independent creators, this is my favorite show for finding new comics. In fact, DINK is my favorite comic convention, period. It has become a celebration of everything indie comics has to offer, and that is a celebration that I am happy to attend. Keep an eye peeled here at NerdTeam30.com as we will have articles and interviews from DINK 2018 coming out for the next week.